hip-hop, Top 40 and mash-ups. Daily: 10 a.m. to 6 p.m.
Infinity cabanas, tables, lounge chairs or daybeds. One of Las Vegas' hottest hotels also happens to be one of its newest properties. 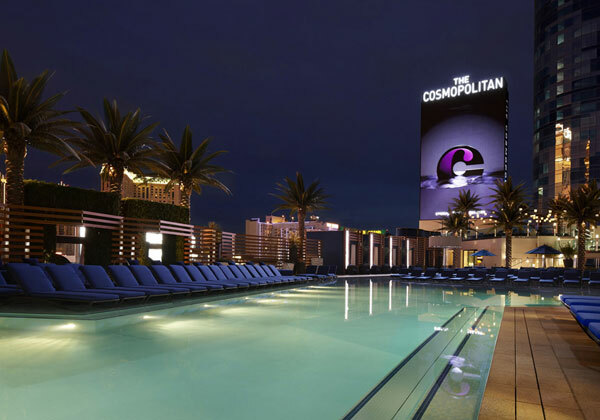 Despite a rocky beginning, including a name change, the Cosmopolitan of Las Vegas opened to a crowd of eager, young socialites and has become the hangout spot for the youthful "elite" of Sin City. Nestled in the heart of the Cosmopolitan is Marquee, one of the hottest nightclubs on the strip. Acting as an extension of both the nightclub and the party inside is the Marquee Dayclub, one of three of the hotel's resort styled pool areas. 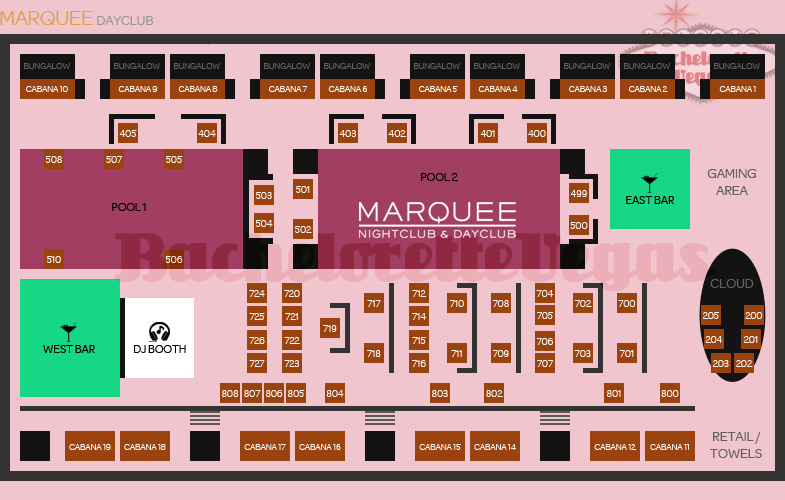 Marquee Dayclub offers the same party atmosphere as any nightclub without the need to stay up past midnight. With such an intimate atmosphere, it is no wonder that the Marquee Dayclub has been home to celebrity sightings ranging from Adrien Brody to Nicole Scherzinger. The stylish poolside lounging and five-start amenities pushes Marquee Dayclub to a level of notoriety that attracts the most prominent of the celebrity elites and, of course, their celebutantes. The club's many celebrity appearances include iconic DJs like Fatboy Slim, Kaskade, and Doc Martin, who have been known to take control of the turntables and introduce their own flair to the party. 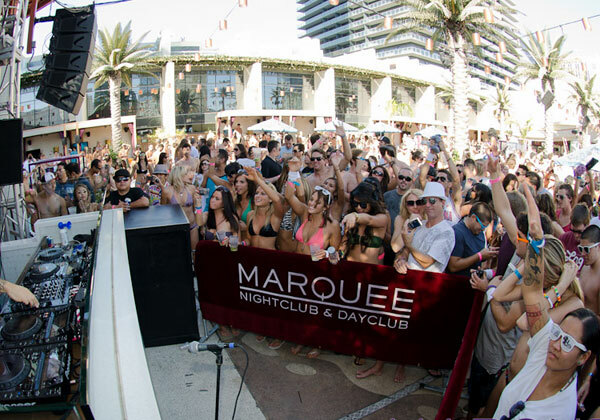 Marquee Dayclub holds common ground with both a premier nightclub and a resort pool. Mixing the fun-loving atmosphere of a club with the relaxing qualities of a pool allows Marquee's guests to enjoy an unforgettable experience. The Dayclub features ten three-story bungalow lofts, all fully equipped with a private pool and party deck that overlooks the crowd below. If your pockets aren't deep enough for a bungalow rental, Dayclub offers the option of renting one of its eight cabanas (stocked with a flat-screen television, a Jacuzzi, and the option of exclusive food and drink service) or lounging about on one of the numerous daybeds. To appease a case of the inevitable munchies, Marquee Dayclub is home to a cocktail and food menu with sustenance created by Corporate Executive Chef Ralph Scamardella. While enjoying a cocktail either by the pool or within one of the hotel's luxurious cabanas and bungalows, guests have the pleasure of enjoying an eclectic taste of music spun by a live DJ. If the constant dance scene isn't enough to hold your interest and you've grown beyond waterlogged, Marquee Dayclub drags the fun of a casino out of the air conditioning and into the desert sun. Blackjack tables are available throughout the Dayclub and add to the "adult-only" ambiance and nature of the club. Though being in one of the Strip's hottest casinos may help the Marquee Dayclub succeed, it can't be overlooked that the venue presents an experience a step above most of the rest. 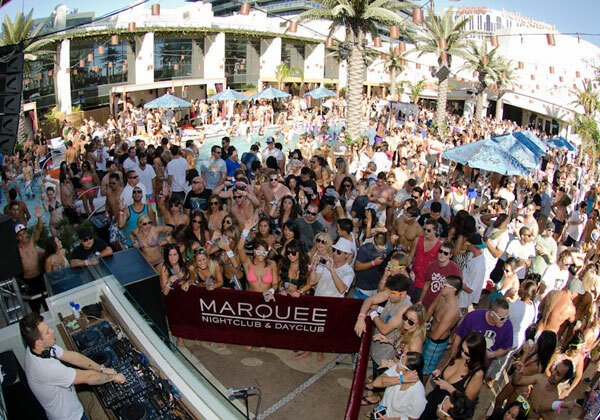 With the ability to stay the night in the club's bungalows, Marquee Dayclub can ensure its guests won't spend their time in Vegas club-hopping.